Politicians should not be ashamed of talking about decay in morals in the country said Opposition Leader Don Polye. “We must not hide God’s name here. The United States presidents do not openly talk about Him but praise Him as well. Those Western countries have become greater because they believe in God. 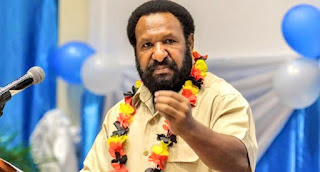 PNG should be the same,” said Polye. He said the government should not have an excuse to mismanage the economy, adding the ministers should not have an excuse to make the people of Karimui and others go poor. “Politicians should not have an excuse to legislate bad laws to make our people suffer. God created us in his own Image. We are proud of that. We must have wisdom, knowledge, and understanding because we were created like Himself. With these, the country should have flourished and prospered. We should be happy and rejoice. God is wonderful. I believe in God,” he said. Mr Polye said he believed in himself that God had given wisdom, understanding and knowledge that he would become the next Prime Minister. “When I become the next Prime Minister, I will make our citizens become real Christians. They should be prepared to die for God and fight against the wrong in the country,” he said.